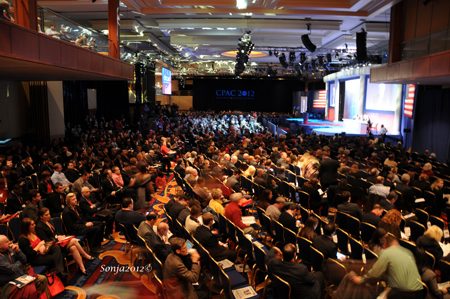 CPAC-12 was fun and exciting. It is the only time you can see and hear so many conservatives and Republicans gather for one purpose, to excite and motivate the GOP electorate. You can get as close to your hero as possible in a throng of over 3,000 frenzied and adoring fans all in one massive room, the Marriott Ballroom. Where else can such a gathering of like minded individuals gather to listen to their hero tell their story as to why Obama must be defeated? I heard this over and over from all speakers in so many different ways that Obama must not be reelected. You hear this song so many times that you are convinced that there can possibly be no one left alive who will actually vote for this commander in chief. But reality hits you the moment you leave the hotel. You see the signs everywhere, the mainstream media in so many forms, TV, radio, newspapers and online. We can not escape reality. Obama is everywhere, invading our every day lives and our nightly dreams. The most inspiring and motivating speeches came from Senator Marco Rubio and Governor Rick Perry, on the first day of the conference, February 9, and Congressman Allen West on the second day, February 10, and finally Sarah Palin on the last day as the keynote speaker. The audiences went wild when these speakers came to the microphone. There were many other speakers but these were my favorite. I will write about the candidates in a following report. It was such a treat for me to get close enough to photograph Marco Rubio and Governor Perry and to actually witness Congressman Allen West being interviewed by the press in the Media Room. Unfortunately, I fell sick to food poisoning on Friday night…something I ate at the Marriott Hotel, but I was able to watch Sarah give her speech via CSPAN. 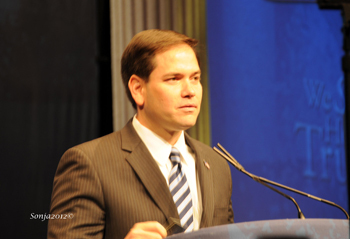 After listening to Senator Rubio there can be absolutely no doubt that he loves America and his God and is willing to fight for what he believes to be true. He seems unassuming and sure of himself. He spoke of the choices we have as Americans and how our choices do impact America. He said that Obama is the only president that pits Americans against each other. My favorite line was, “The Democrats never fight about who is more like Jimmy Carter”! While the Republicans see who is more like Ronald Reagan. We have to be strong economically and militarily and its people have to be strong, he said. “The strength of our nation is from our people,” was an inspiring statement. The Human Health and Services mandate is a constitutional issue not a social issue, he continued. The federal government does not have the power to force religious organizations to pay for things that that organization believes is wrong. “The president of the United States looks like he is a really good father and a really good husband but he is a terrible president.” I was surprised that Rubio said this, but oh how true his statement! He closed by saying that we should be grateful for being an American at this time in history. He went on to say that this administration was assaulting the Catholic faith, and that Obama’s war on faith must be defeated. 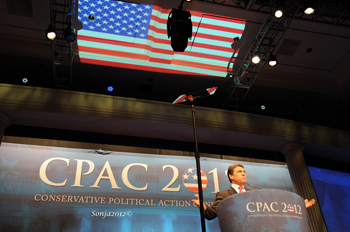 Perry firmly asserted himself by saying, “We must win this WAR”! I couldn’t help but wonder where this fighting spirit was during the campaign. 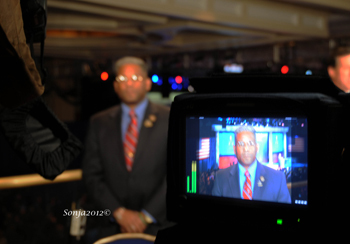 I was fortunate enough to find Congressman Allen West in the Media Room where he was being interviewed by the press. I waited patiently while taking photographs for him to finish. After his interview, I shook his hand and thanked him for his efforts in taking back America. His hand was cold, so I suspect he was a little nervous about his imminent speech to the over 3,000 fans waiting to hear him in the Marriott Ballroom below. He began his speech by thanking all of us. “With your help we were able to take back the House of Representatives.” He told everyone that that was a moment of triumphant in 2010 but that a new battle was waiting for us in 2012. “Our goal is to keep the house, take the senate and occupy the WH with conservatives,” he said. The audience responded in thunderous applause. As I said earlier, I watched Sarah from my hotel room due to some food poisoning. Sarah was forceful in her words, and I noticed something different about her speech, she had plenty of sound bites, that is, sentences that could be put on bumper stickers or used as slogans. While I like Sarah very much and enjoy hearing her, I have been very disappointed that she has refused to endorse a GOP presidential candidate. In fact, her round about way of endorsing Newt Gingrich makes me wonder, what is her point? Either you do or you don’t endorse a candidate. 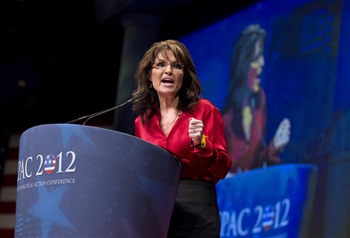 Since her speech at CPAC-12, rumors are that she would be willing to run for president. Is she taunting us again like before just to disappoint her supporters again? She spoke about a ‘brokered convention’ but whispers of a ‘brokered convention’ have been around since before Perry dropped out. During the course of her speech a heckler was escorted out and the crowd broke in a USA, USA, USA chant. So Sarah is still the #1 hate attraction for the Liberals. “We aren’t red Americans, we aren’t blue Americans, we are red, white and blue and President Obama we are through with you,” she shouted. In another phrase she said, “You, I, say we keep the change, referring to Obama’s remark about being small town bitter people that cling to our guns and religion, and we will keep our God, our guns, and our Constitution.” The audience gobbled it up by whistling and clapping. She told the audience to ‘return power to the people’! Washington, DC is the home of the permanent political class where millionaires are minted over night, she continued. DC is where the government rich live, while we work hard to keep Washington, DC going. The old Washington of our founding fathers was where you came to serve the people. Today Washington is Obama’s Washington. Sarah had plenty to say, but it really is time that Sarah belly up to the bar, run or endorse!